My spouse asks with a certain mode of temper: another classic-car? 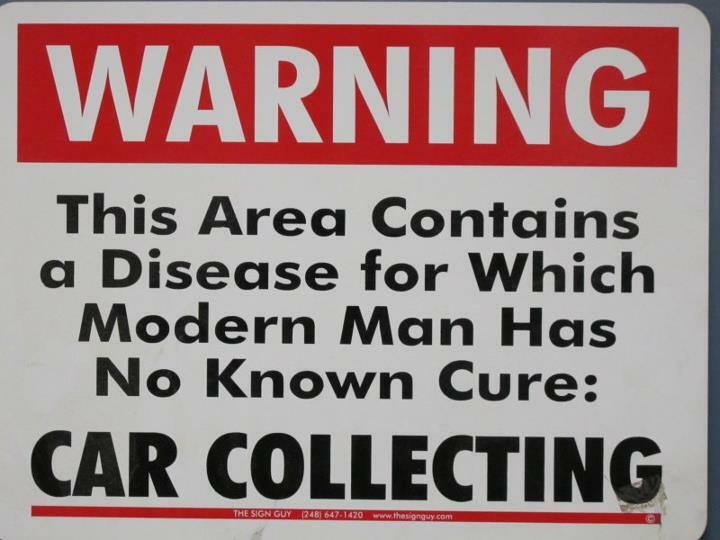 As big boys know well, spouses often cannot appreciate our investment decisions nor that we are stricken by the now famous verse of “Car Collecting, a disease for which modern man has no cure”. 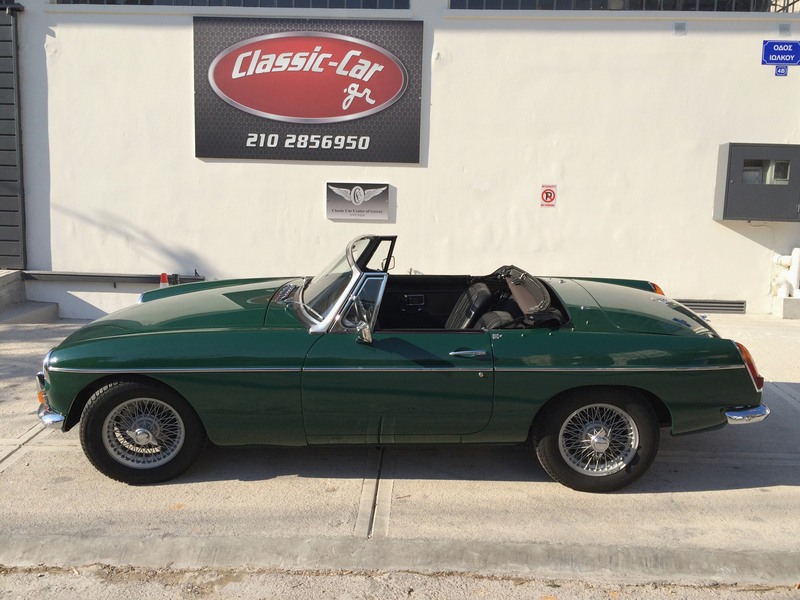 So when a good friend brought few days ago his 1969 MGB Roadster Mk II in true British Racing Green livery at the Classic-Car.gr for storage and with an accompanying ‘FOR SALE’ tag, I was prompted to take a closer look. We raised the car on the lift and thoroughly inspected the undercarriage, mechanicals, body condition etc. 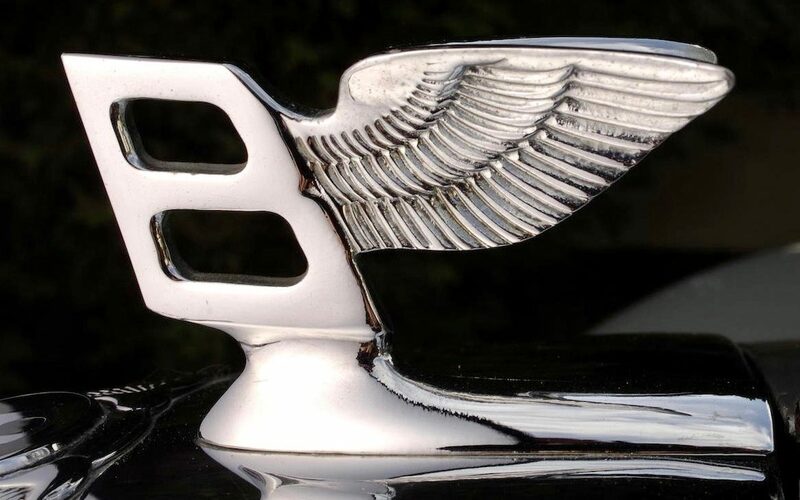 The verdict was positive with few minor and cosmetic ‘to do list’ items which will need attention in order to bring the car up to a top cruising condition. Because this is the main role of this particular car. To be driven as much as possible and to be enjoyed. Hence the car is now registered with regular license plates and insurance coverage for daily use. The MGB is featured in a British Post stamp! 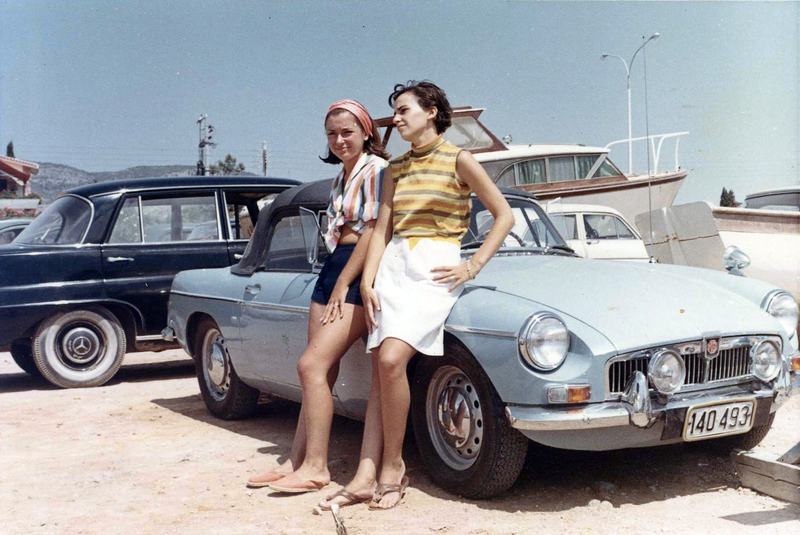 My personal memories of MGB’s go back to my teen-age years when in the mid 60’s an Olympic Airways pilot, Lambis Costides had owned a light blue MGB Mk. I. (For my Greek readers, another account of Lambis can be found here ). 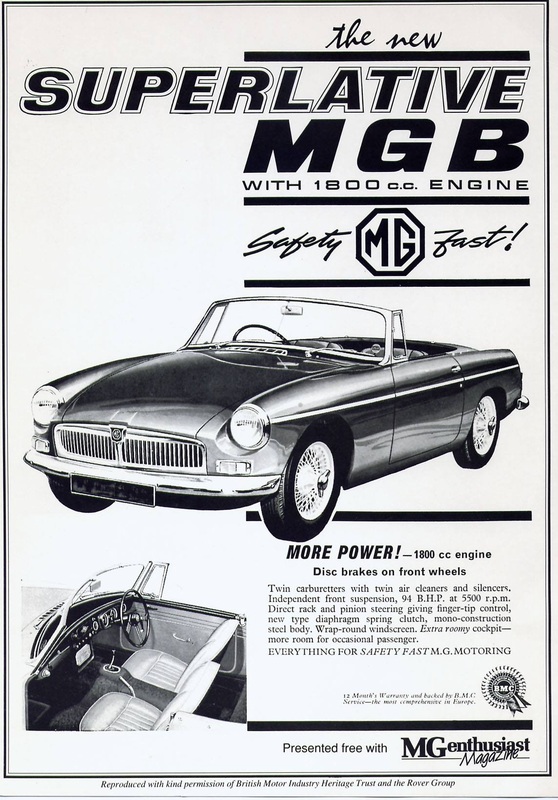 With the motto ‘Safety Fast’ a period MGB advert. He had fitted a pair of spot lights and inside the cockpit an aircraft switch with telltale amber light, activated them; I was very impressed. Another admiring memory was when Lambis drove us quite fast down Syngrou Avenue during a hot summer night, hearing the distinct roar of the exhaust and experiencing the thrill of wind noises which only sporty roadsters can offer. 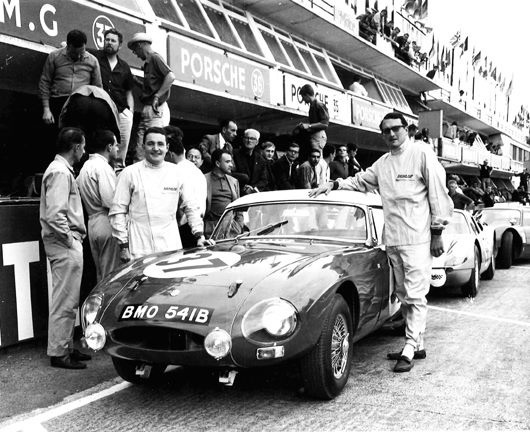 MGB’s were and still are raced extensively. Here with Paddy Hopkirk. All these memories came back to me when I first saw the BRG [aka Byron Riginos Green 😉 ] car. I warmed up on the idea of owning an affordable classic roadster, not having to spend a fortune to bring her up to my spec’s and setting a goal to use her as much as possible for my short commutes from home in Kifissia to my www.3cg.gr man-cave in New Ionia. Other aficionados tell me that MGB’s are great Historic Vehicles for entering into Regularity Rallies, a sport that we do several times through each year. 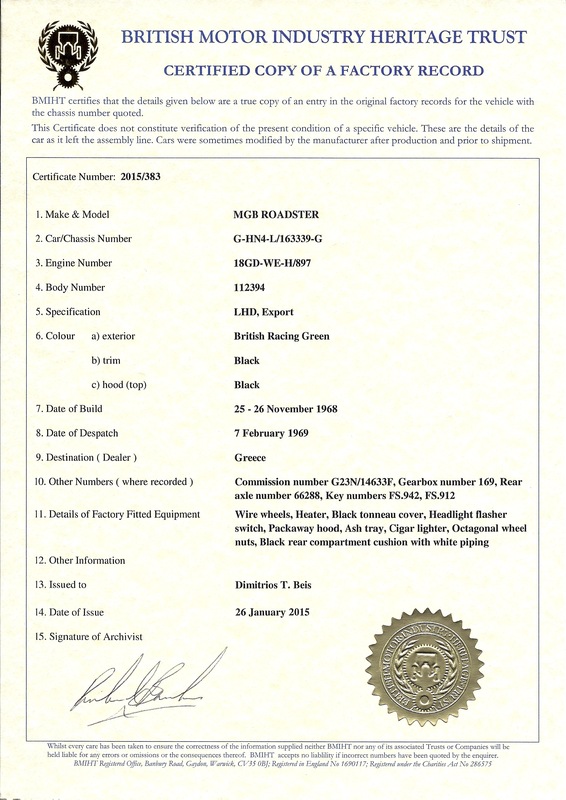 To boot, classic car prices are on the rise, and this example, Chassis No: GHN4L163339G, Engine No: MG 18GGWEH897 was an original Greek import car, first licensed in 1969. She also carries a “Fédération Internationale des Véhicules Anciens” (FIVA) Identity Card with A/3 classification. What all these mean is that she is a highly original car which always lived in dry, sunny, no salty Greek roads and that she bears regular license plates; hence she can be used freely on the roads without the restrictions imposed on H.V. licensed cars. Enough reasons to go ahead right? Ipso-facto a friendly deal was negotiated and the car came into our family on 15th January 2015. Also pleasant is to know (according to the British Motor Industry Heritage Trust certificate), that this example was first dispatched from the factory to Greece on 7th February 1969 and that she is ‘a matching numbers’ car! 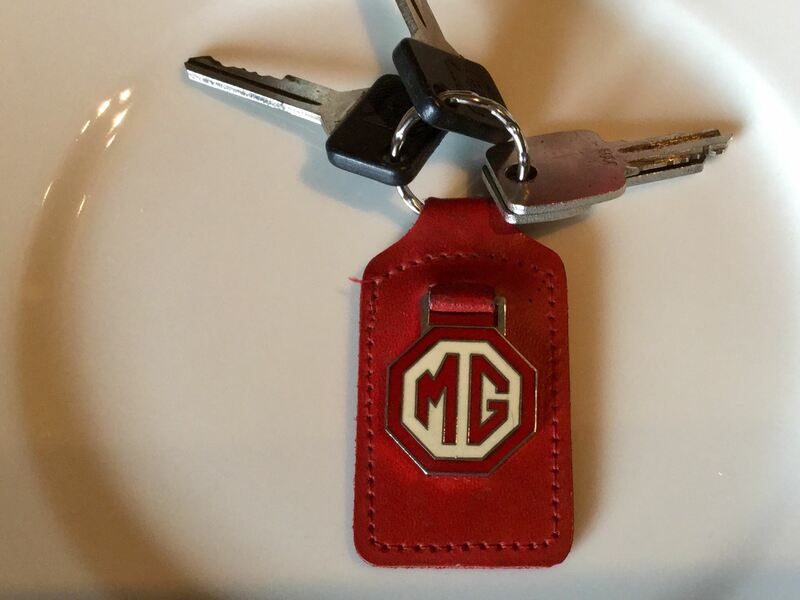 The British Motor Industry Heritage Trust, tells the true provenance of this MGB example. A picture Gallery of the ‘new’ car follows; upon clicking on any picture, the viewer opens in larger format. Rear view of the MGB, just moments before taking her for an extended first road test on a sunny but cold mid-January day. Note now the car bears regular licence plates. Thumbs UP!!! Great choice Byron for an everyday classic. Character, Reliability, Parts galore, and last but not least a soft top to pull up only when it rains!! !